I finished the last of the three Phoebe’s sweaters, bought buttons and now this is done. I’m a bit worried especially the biggest one will be far too big. But better too big than too small, don’t you think? They’ll grow into it. I won’t be there when they receive it so this’ll spare me the possible embarassment of unfitting gifts anyway 😉 I need to admit that as much as I love this pattern and the yarn, I’m super happy I finished the last one. and I’m not going knit another one any time soon. A friend of mine requested one for once she has children, no matter if it’ll be for a boy or a girl, but that gives me at least a 2-3 years break because she’s not even pregnant and the smallest pattern is for a two year old. I finished my last planned christmas present, the thick cowl. I used three strands of a beautifully teal coloured yarn (the picture doesn’t do it justice at all. It is far darker, check the picture with the books!) to get the required bulkyness because I couldn’t find any nicely coloured bulky yarn not even if I would have been willing to pay a hefty price. And SMC Bravo makes an absolutely nice look even though it is just acrylic. Unfortunately it didn’t work out just as planned. After I turned my last cables I was able to knit the last four rows but didn’t have enough to finish the last six rows of ribbing. So I had to buy another skein of yarn. But thats ok. I was able to add another turn of the cable because I wouldn’t wanted it to be shorter than it is. And because I finished all the other things I started another honey cowl with some left over yarn from the last cardigan. If I finish it by the 23rd then it’ll become a christmas present. If not, than it’ll go into the “just in case box” that either supplies charity by the end of next year or will be gifted to someone throughout the year. Yes, there are some other unfinished objects in my bags that I could have turned to like that hibernating lace shawl, the gloves and some socks that I cast on but never really started but I guess I’ll work on that after christmas when I start my new year knitting plan. And I’m reading new books! I was at home at my parents’ and got some new “supply”. 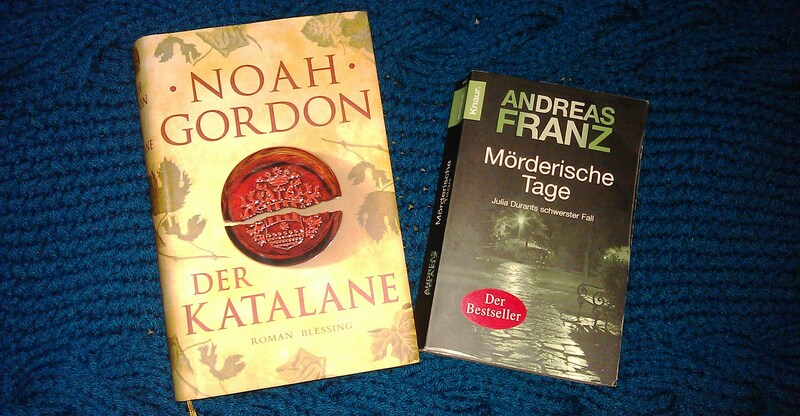 I’m reading “The Winemaker” from Noah Gordon which in German is called “Der Katalane” meaning “the Catalan”. So far it is a good book. Well it is Noah Gordon. By the way, “The Physician” premiers at the movies on christmas so I guess we might go and see it as a family during the holidays as we all loved the book. The other book is a crime story for some spare time reading. What are you knitting and reading? Christmas knittings all finished? This entry was posted in Knitting & Crocheting and tagged Cardigan, Cowl, Knitting, Yarn Along by kathatravelling. Bookmark the permalink. congrats on finishing the Christmas knitting. What great color yarn! Have a wonderful Christmas. Thanks! Have a wonderful christmas too!